“Perseverance!” That’s the rally call chosen by the class of adult learners I work with as a literacy tutor. Learning to read isn’t an easy skill to master, and it takes time and practice. But sometimes practicing the skills needed for reading can be fun! Many websites provide free online games that make learning more fun. When I began volunteering with the organization literacykc.org to help adults learn to read, I discovered something astonishing. I may have learned to read a long time ago, but I didn’t realize how little I knew about the process of mastering this skill! I wanted to be a super good tutor, so I began to look for information on the Internet to learn more about how to learn to read. There are many tools and sources of information for learning to read that are available online, but it takes a lot of time to find the best resources. If you are looking for great resources organized logically in one place, check out the Phonics Kit for learning reading. This leads to separate posts on literacy skills with more links to free online games, printable games, and videos. Save tons of time with everything you need to learn how to read organized and easily accessible in one place: get 16 games, 24 worksheets, 11 word sorts and more in the Phonics Toolkit. In becoming a literacy tutor, I learned about the importance of phonics: understanding the relationship between letters and sounds. There are 44 sounds in the English language. With a few exceptions, the consonants make one sound. Vowels can make different sounds, and there are some clues to tell if the vowel is long or short. Finally, there are some other sounds made by different combinations and conditions. The games in this post are targeted to practice the skills needed to understand the sounds of the English language. CVC (Consonant-Vowel-Consonant) Words, which have closed syllables. A vowel that comes before double consonants, like apple, letter, dinner, off, summer. Vowel teams – some make a sound like a long vowel. Please note that many of the games require Flash and may not work well on some tablets and smartphones. It can be helpful to download the Puffin browser. From softschools.com. Silent E game at starfall.com (pc only) At education.com with sign-in. Diphthongs at softschools.com and the Coconut Vowels game at arcademics. BBC games (in Explorer) and Forest Phonics from ictgames. Consonant Digraphs Digraphs at softschools.com Forest Phonics also has some digraphs. abcya.com – a teacher-created website that provides fun and educational games for kids. Pre-K through 5th grade, and includes games for learning letters (also numbers and more) It is free for use on pcs (ads) and can be obtained for mobile or tablet use with a subscription. arcademics.com – arcademic skill builders are free online educational video games that offer a powerful approach to learning basic math, language arts, vocabulary and thinking skills. These are highly engaging and some are multi-player. Apps are available for both Android and iOS. www.education.com – has many resources on a variety of topics. To access worksheets and more resources there is a subscription fee, but there are many games available for free (with a sign-in) for learning reading skills. Funfonix.com – free online games (and worksheets) for phonics. Galactic Phonics – free resources created by teachers. It can be difficult to find games to practice diphthongs, this site has a good collection plus more. Find them all at Symbaloo. Kizphonics – an online phonics program which provides a few games on each level free, access beyond that requires a membership. Literactive – many online games for phonics skills including phonemic awareness. So many that I made a Symbaloo of them. Great resource! Mr Nussbaum – has lots of literacy games and interactive resources. Two Letters with both digraphs & blends is no longer free. pbskids.org – a website from the Public Broadcasting System which is aimed at preschool kids. readwithphonics.com – free for schools, libraries, & educational organizations with 10 or more students. Parents can pay for access, and there is an app available. RoomRecess.com has lots of reading games. Many are available for both pc & mobile. Skillswise – provided by the British Broadcasting Corporation, this website includes a section of English Games. There is lots more about reading, writing, and math for higher levels. softschools.com – provides many resources for free, including Phonics. A premium subscription is available that removes ads and lets teachers set up student account to track progress. starfall.com – provides some free content on phonics aimed at early grade levels, with expanded content available for a subscription. Be sure to check out the phonics games. Free app is available. turtlediary.com – provides many resources for free on PC only. Premium subscription removes ads and allows mobile play. yourchildlearns.com – some free online games for reading. diphthong-two vowels combine to make one sound with mouth positions that change. Too many people struggle with learning to read. Low literacy levels often mean limited options for employment, according to “A First Look at the Literacy of America’s Adults in the 21st Century ” at the National Center for Education Statistics. Help to make a difference by sharing these resources with anyone who wants to learn how to read. Which games do you like the best? I’d love to hear your vote for a favorite game, or if you know of some others that would be great to add. Also I appreciate knowing if any of the links change. Just leave a comment at the Daily PlanIt Facebook page. 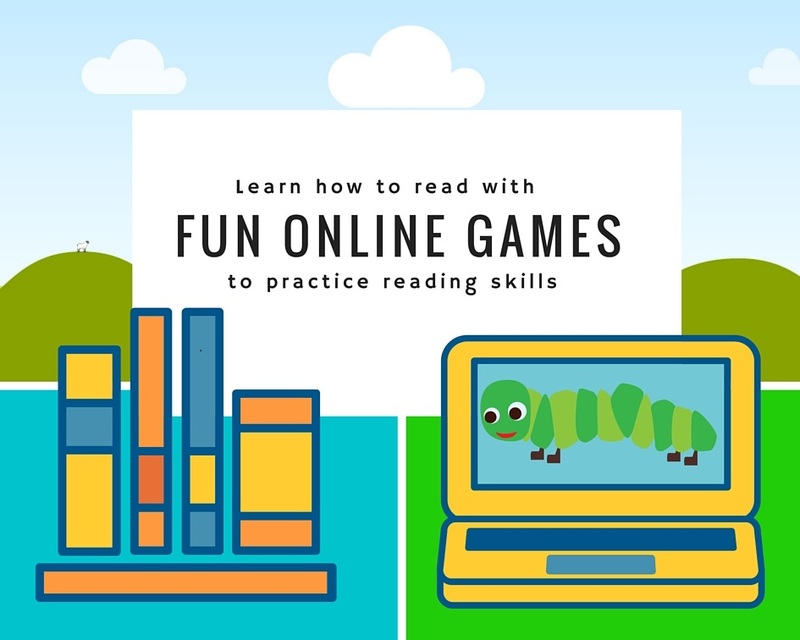 The Free eBook “Learn How To Read With Fun Online Games” (pdf) has the links to these free online games, plus even more games to practice more advanced skills for reading. Download it to your computer, smartphone, and/or tablet for easy access to the games wherever you are. Printable Games for sale at my Super Tutor Tools store at Teachers Pay Teachers. Final Consonant Blends-set of cards, each card has six words that end with a final consonant blend. Roll a die to build words and practice them. Roll a Silly Sight Word Sentence-is a fun, free way to practice sight words.